The release of Solid Converter® PDF to Word v6 represents yet another milestone in the development of our popular PDF to Word conversion software. Solid Converter PDF not only gives you the power and flexibility to get the job done, it does so at a fraction of the cost of other PDF to Word conversion products. What’s new in Version 6? Great new features that will save you time and money. PDF Bookmarks from Office. Automatically create PDF bookmark outlines from Word, PowerPoint, Excel or Publisher documents. 64 bit Platform Support. Solid Documents products now run seamlessly on Windows XP 64 and Windows Vista 64. Visit our web site for a complete feature list for Version 6 or to download our FREE 2 week trial version. 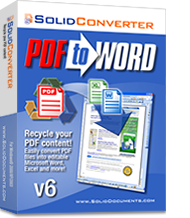 Compared to other PDF conversion tools costing hundreds of dollars, Solid Converter PDF to Word v6 is only $79.95 - Buy Now and see how much time you'll save!